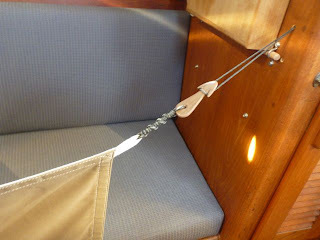 Two marlinespike projects: Cockpit foot mat and a lanyard for holding 2 rolls of toilet paper in the head. 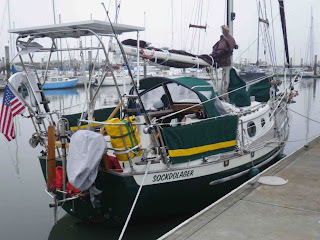 How it started: One cold winter day in Port Townsend a few months before we departed, both of us were frantic with chores—getting the boat ready to cruise and the house ready to rent. The longer the list got, the shorter our creativity became. We wanted to secure the boat for a potential knockdown, to make sure the contents of lockers or other items would not spill out in severe conditions. 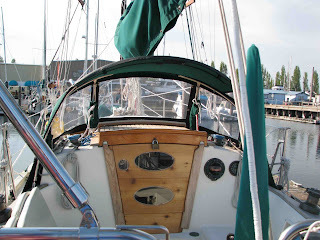 John Vigor wrote an excellent book on getting your boat ready for sea; in it he says over and over: imagine your boat upside down. We did, and we didn’t like the idea of things flying around the cabin causing injury. 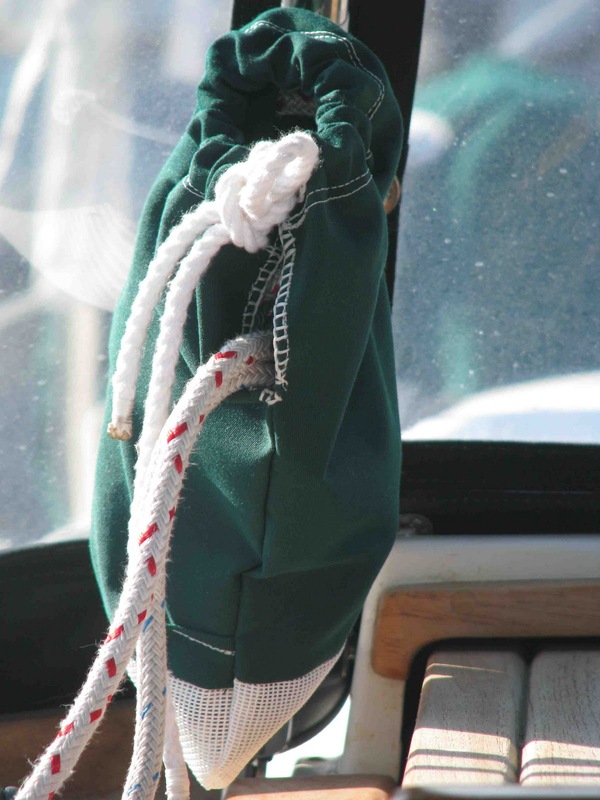 We needed someone to help us think of creative solutions for upside-down-proofing the boat. Enter our friend Leif Knutsen, retired shipwright. Leif’s method is to think of not just one, but at least three solutions to any problem; then pick the best one, which will usually be the simplest. He prefers using wooden wedges and marline lashings to expensive fastenings; they’re simpler, just as strong, and beautiful to live with. 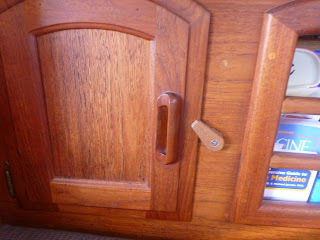 He began with some obvious fixes such as latches for cabinets and drawers. 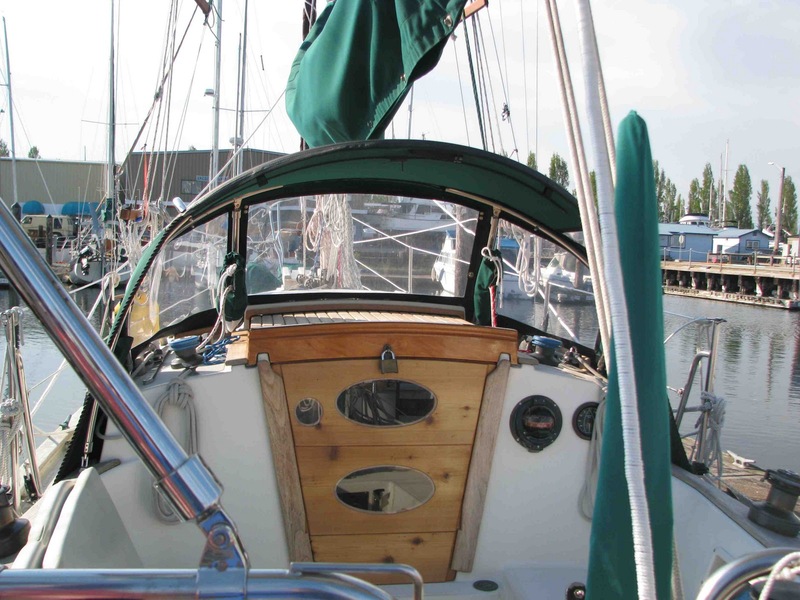 The wood used by Leif included teak, mahogany, cedar, ipe, and marine plywood. 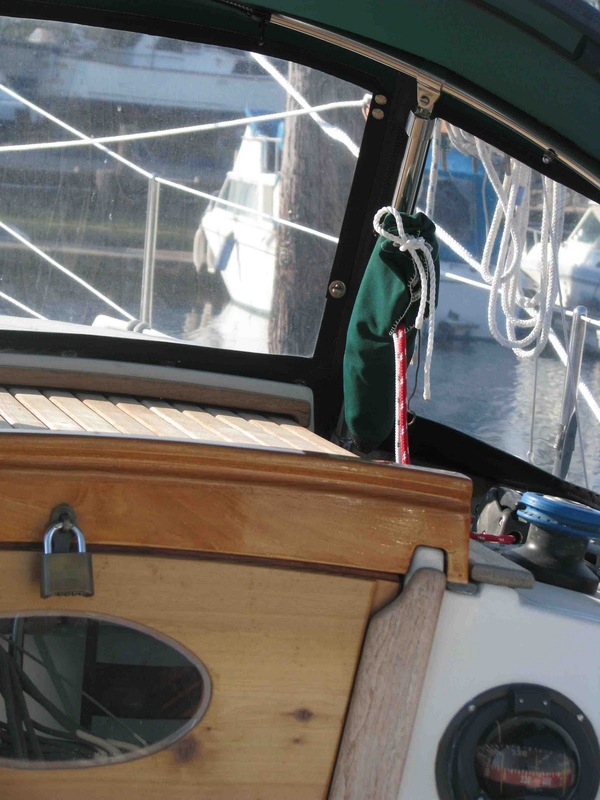 All surfaces were hand rubbed and finished with Daly’s teak oil. We'll add to this page periodically until we run out of stuff to tell you about, so check back or do the "Follow" thing to get automatic updates. Food storage lockers: A Dana 24 has large lockers under each settee, but the lids are not secure. 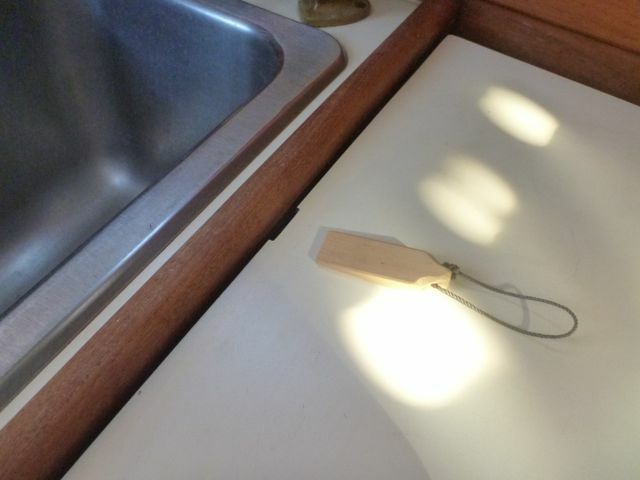 Here’s how Leif, using bits of wood, small metal rod stock, and lashings, solved it. 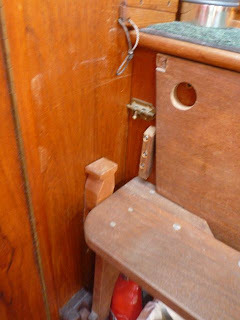 No hinges needed, just a hole in the outboard side of the fiberglass frame and a latch at the front with a guard to keep cans from opening it. 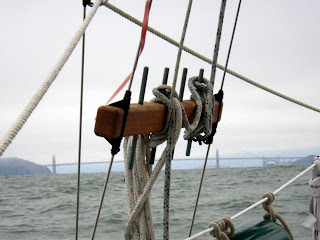 Leecloths keep you in your bunk at sea; Leif carved us some wooden arrow-shaped hooks and rigged up loops of marline. Works great! 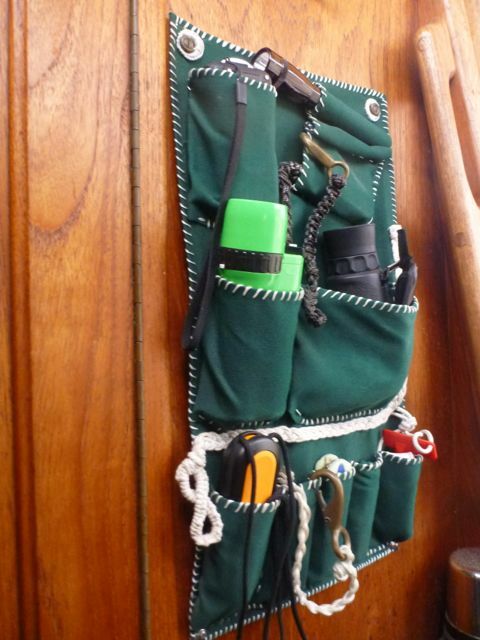 Galley belt: Karen made this as a temporary solution but liked it so much it's now permanent. 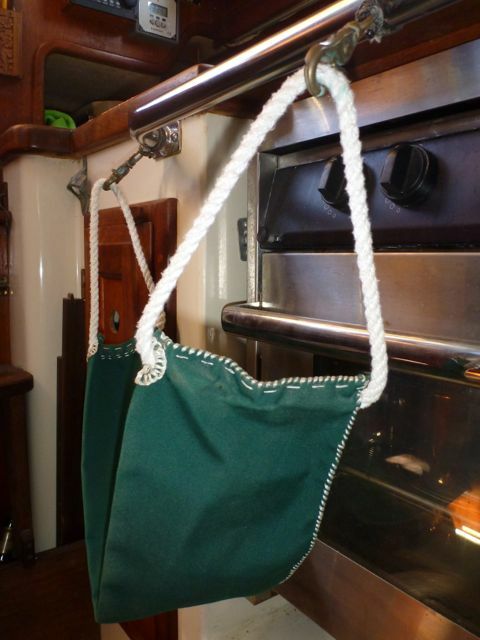 Worn like a water-ski belt, it will free up both hands for cooking at sea. Nothing's harder than trying to cook with one hand while hanging on for dear life with the other. 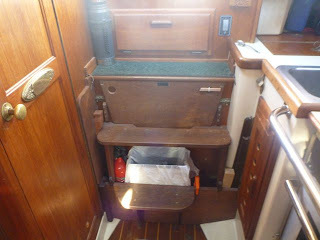 Hanging locker conversion: Who needs a hanging locker on a 24-foot boat? With such a need for space, we decided to claim every inch inside that commodious locker with this conversion. 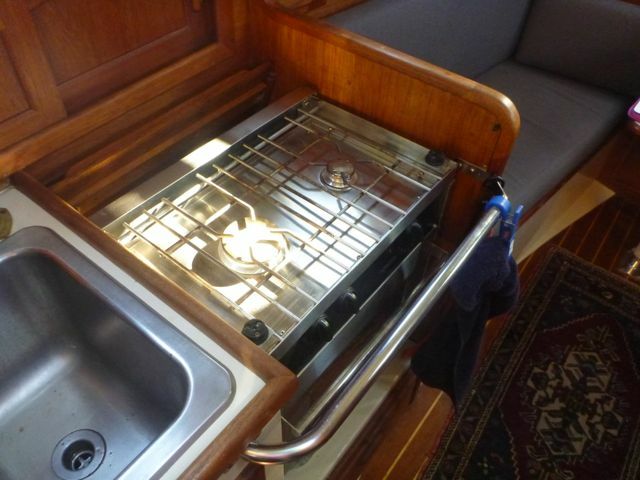 The drawers go all the way out to the hull and the top 2 hold lots of clothes; the bottom drawer holds pots and pans. The locker under the stove where we used to keep galleyware has been converted to a tool locker. 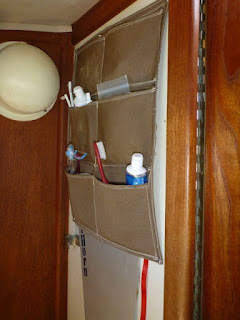 On each side of the hanging locker drawers are a couple inches of unused space, and these Jim converted to chart storage, using thin pieces of clear plexiglas to keep them straight. 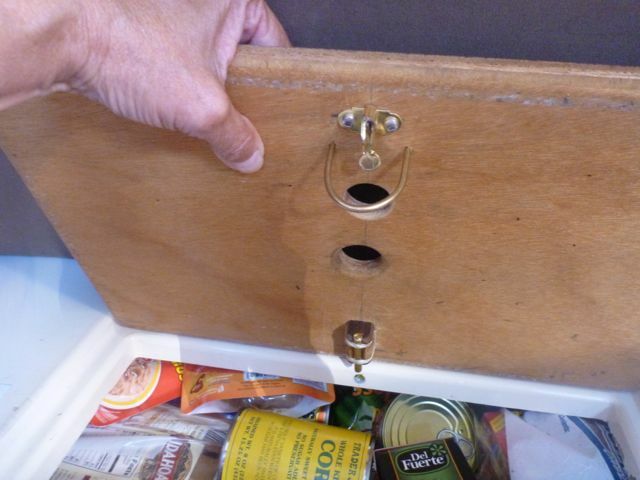 The bottom of this locker can be used for "deep storage;" stuff you rarely need. 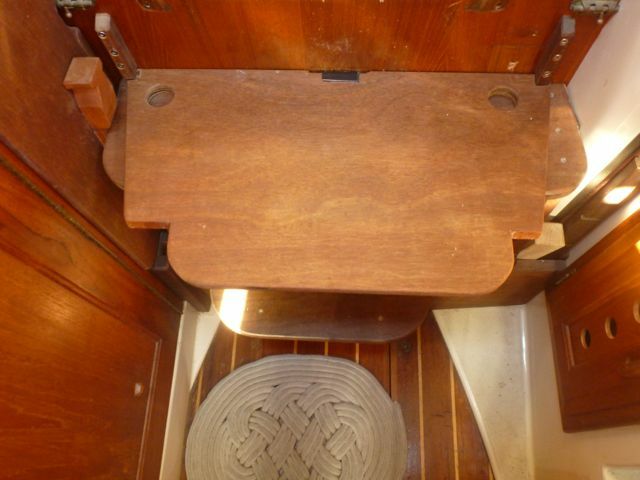 Same for the space above these drawers. 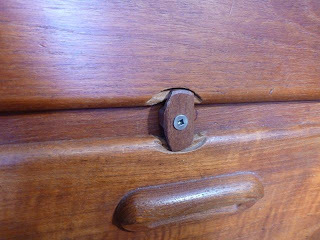 The drawers are marine plywood, with angle irons and special "gorilla" tape sliders. Simple and it works great. That's our stereo with iPod dock just above the hanging locker. Storage bins: Behind each settee back there are two open bins. Normally the cushion holds in the contents, but we wanted something more secure because at sea we might remove the seat backs for more shoulder room. With ovals of plywood routed at top and bottom and a rotating handle that stops at the screwhead pictured, each bin is secure. 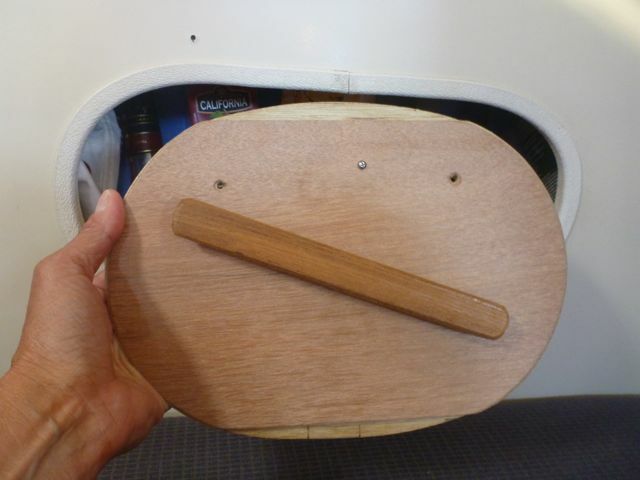 We can also turn them around to the smooth surface on the inboard side. 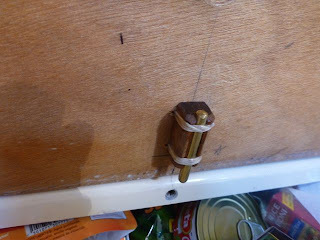 The tiny screw head near the top acts as a stopper. Disregard the holes on either side, they were from a previous experiment. Multipurpose companionway: Dana 24s have a hatch board in the cabin sole at the base of the companionway, that lifts up for access to the bilge and fuel tank. We wanted to secure this, but also to better use the space occupied by a set of steps. 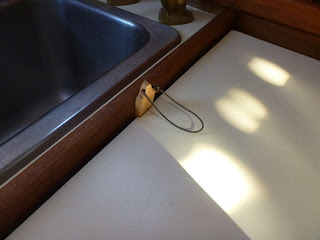 Leif’s ingenious design is a real pleasure to live with because it does so many things. 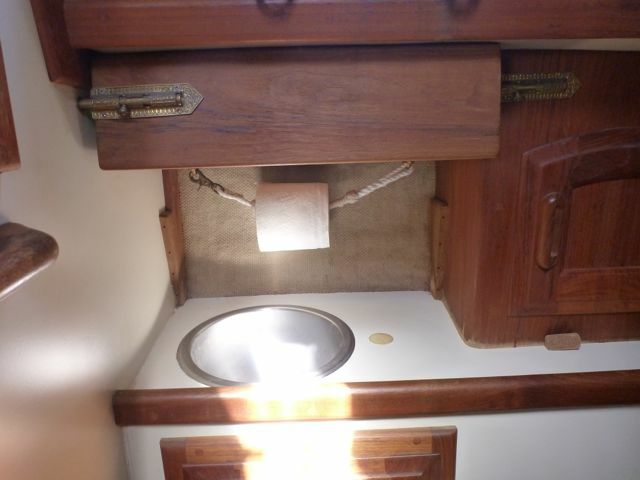 Here’s the new companionway completely assembled. The whole thing comes apart like a puzzle piece. We use a large ammo can as a garbage pail because it fits perfectly and allows storage on the side for the fire extinguisher and other items. 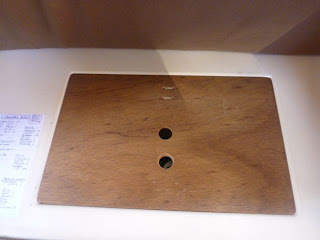 That large backing piece with the hole in it pops right out to make a galley seat of more counter space for the cook. The holes were originally for pins to secure the large opening to the engine compartment, but Jim has since built another system for that. 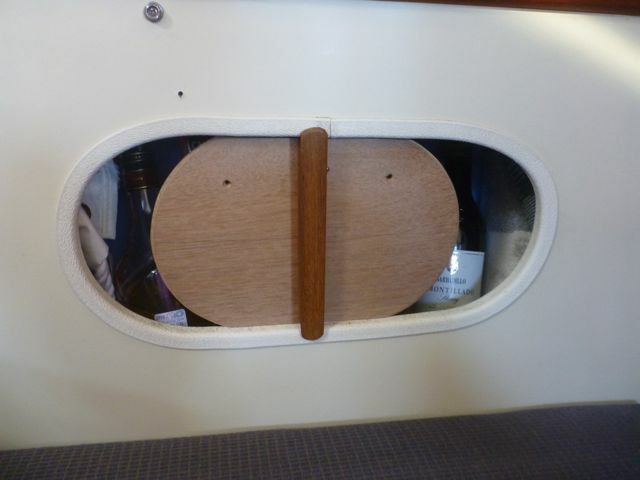 The bit of white bungee cord with a piece of wood through it on the right side hole helps secure the galley seat piece tightly. Also, Leif carved a small amount of the plywood right under where this piece fits under the vertical braces (you can see this 2 photos down). Told you it's fiddly! The side piece has been removed and the wedge replaced in its secondary position. 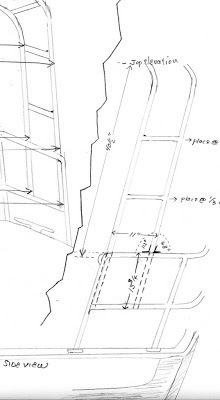 This wedge is the key that holds the whole assembly nice and tight. You can also see a small wedge with a loop of line on it going fore-and-aft; pull this wedge and it's matching version on the opposite side, and the step comes out so we can check the engine without having to remove the entire companionway assembly. Now watch what the side piece does! It turns into a nice sheltered seat for staying warm and dry on night watches, or a good little table for serving hors d’oeuvres. 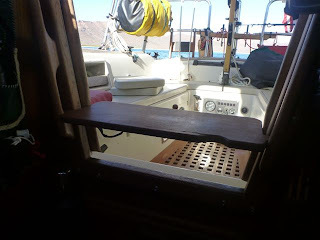 You have to make notches in the companionway’s exterior trim boards and the grab rail may need a bit of shaving, but to us it was well worth it. Stove safety: Our Force 10 stove is secured on its gimbals in the event of a knockdown, but the nice wood-and-formica cover that pulls over it wasn't. 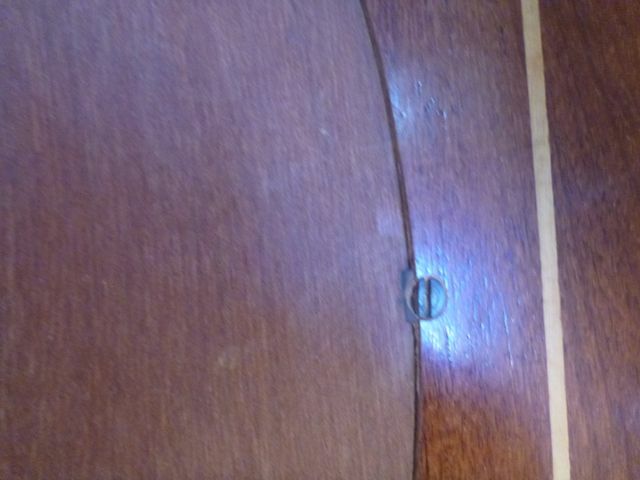 Two wedges pounded into little slots (with loops of marline so we can pull them out) fixed that issue. More! We need more! Let's drill a hole in the sole! A Dana 24 has an unbelievable amount of room for storage, but hey, it's still a small boat. We wondered: what’s under the cabin sole? It was a solid piece of thick veneered marine plywood, and we knew there was about 3 inches of space between it and the top of the keel. (We discovered this when we replaced the fuel tank last year and could see under the sole.) 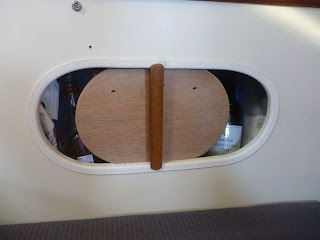 With Leif’s expert help, a hole was made in the cabin sole and a lid fashioned. Since there is the possibility of water dribbling through here from the anchor locker, Jim placed astro-turf upside down on the keel surface. This keeps everything above it dry, and allows any dribbles to run through the “grassy” side. 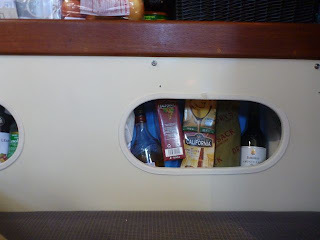 We use it as a sort of bosun’s locker, to store small cordage and other items not sensitive to moisture, but most things are stored in plastic bags to be sure. 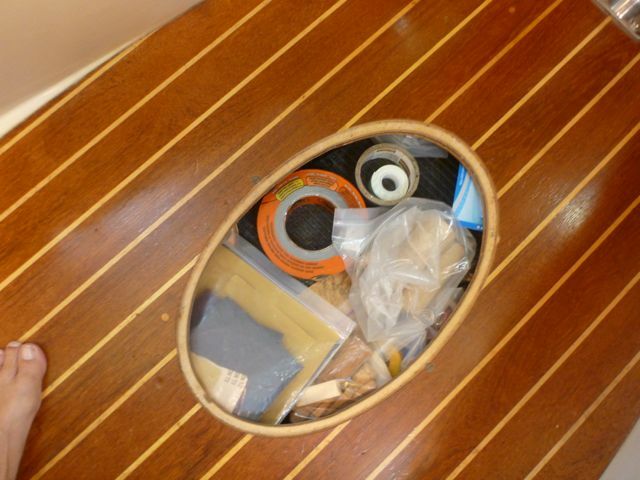 There’s at least 1 ½ cubic feet of additional storage under the sole that we didn’t have before. A wood screw on each side was flattened at one edge, and if turned, would secure the lid to the cabin sole. 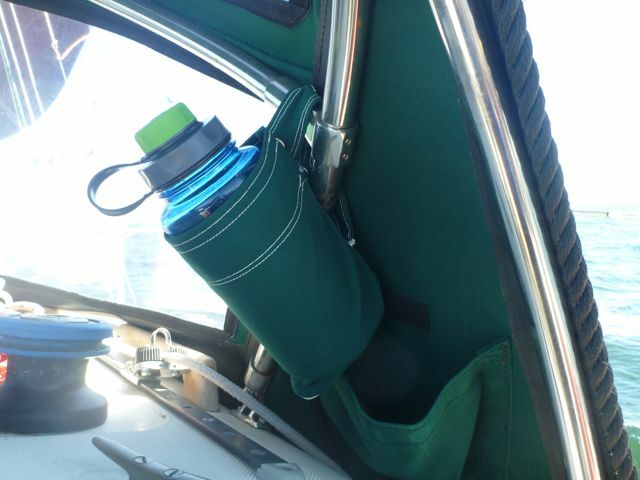 Thermos safety: Every boat should have something to hold hot water or coffee, but securing it while pouring boiling liquid is tricky. Here’s how Leif solved the problem. A small wooden corner “horn” holds the thermos, which has a stiffened piece of marlinespike that captures the horn. Use one of those flexible funnels and bend it to catch the hot water, and you have a hands-free, safe operation. Nav station: Jim came up with the idea of a teak box secured to the bulkhead under the ham/SSB radio, that folds up when not in use, secured with a dowel for a hinge, and a screw-head and a loop of marline. 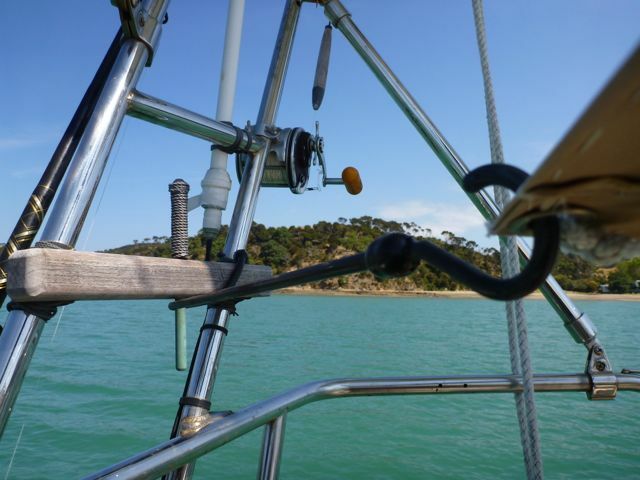 We can keep it protected at sea, connected to the radio and ready for use in downloading weatherfaxes and email. 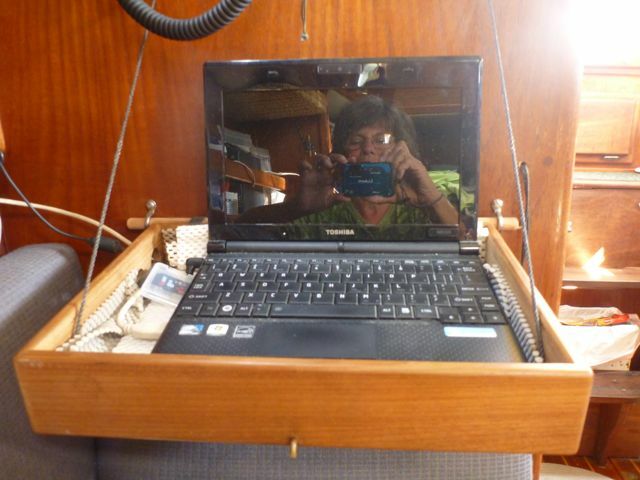 This shows you how we've been able to email blog posts from at sea in relative comfort. Nothing worse than a laptop flying around the cabin, unless it's the cook. 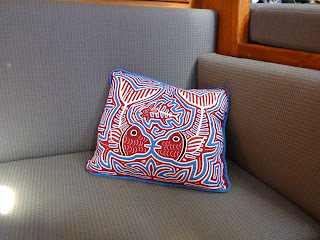 The little carving we had aboard finally found a home, too. Here it is ready for use. Come to think of it, this would make a nice mirror, too. 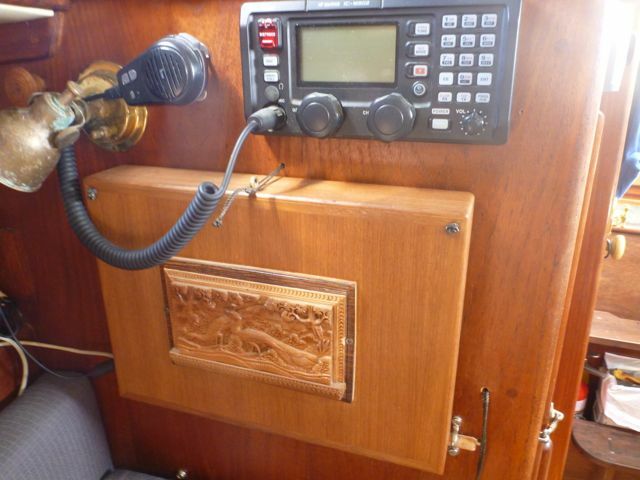 Of course a radio like this is bulky, and finding space for all the parts was a dilemma. 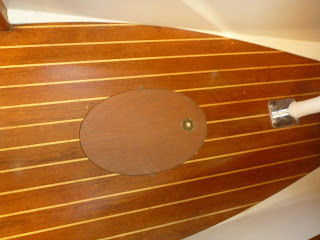 Jim solved it with a swing-down teak box in the head just beneath the porthole (but designed out of the flow of any drips,) and some unused space way back in the top of the port cockpit locker. 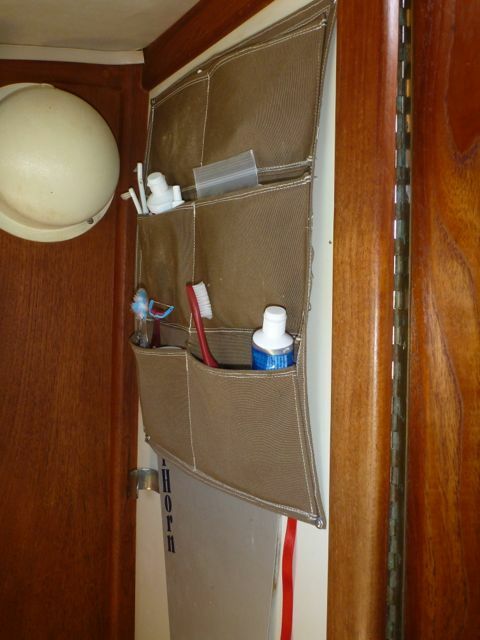 Under the teak box is the lanyard that will hold two rolls of toilet paper, a handy thing at sea. 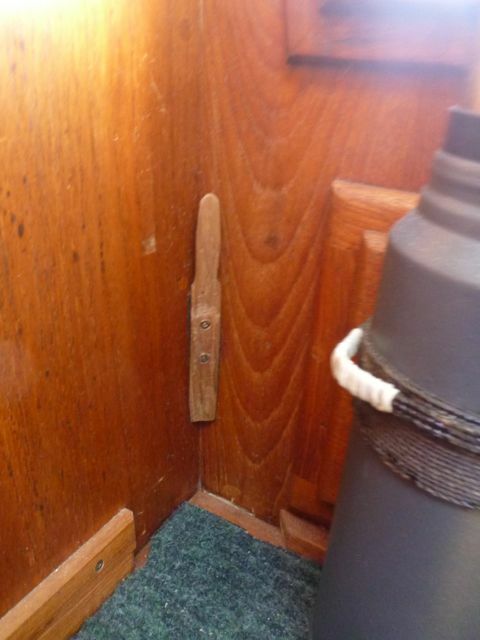 A couple more interior fiddly bits, just a few small projects made by Karen. 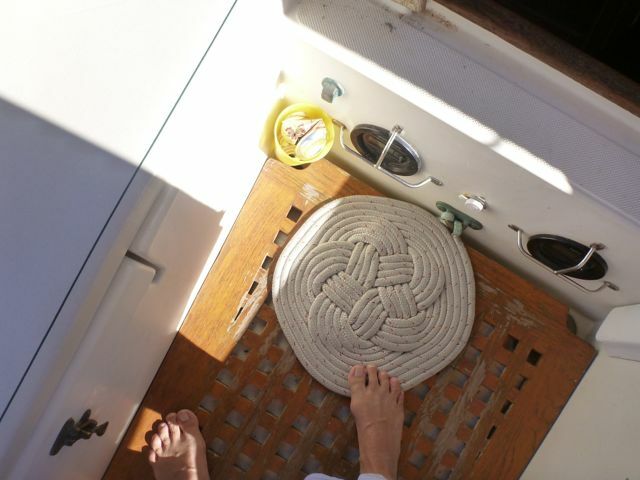 We don't have a sewing machine aboard, so it gets done by hand. Hand soap holder: A little bag for a hand soap dispenser in the galley. We just refill it with dish liquid, which works fine. Companionway handy storage: A set of pockets near the companionway is very handy for flashlights, knives, camera, ignition key and more. Pocket storage for the head: Same thing as above, only not as fancy. Both vanes (heavy and light wind) for our Cap Horn self-steering slide behind this canvas pocket and store themselves safely and out of the way. 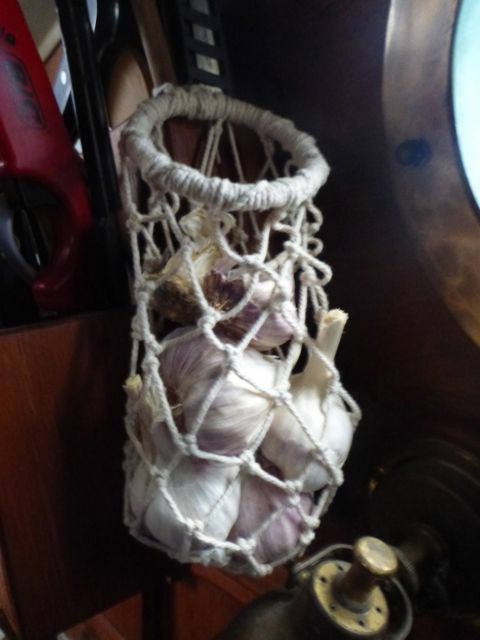 Nets for fruits and veggies: A little net for holding fresh garlic. Karen made a larger one for onions, and when we were in the tropics we had two more hanging under the solar panel on the arch, for holding fresh pamplemousse, breadfruits coconuts and other goodies. 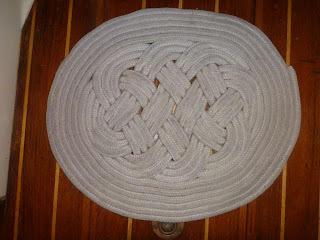 Instructions for net-making can be found in The Arts of the Sailor, and in online tutorials. 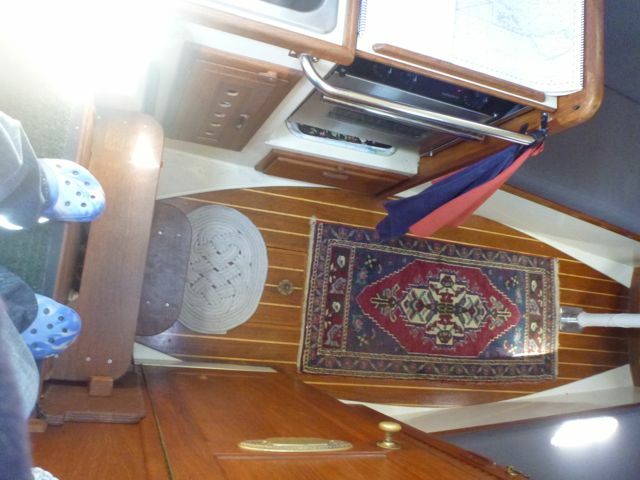 Aesthetics and comfort: A good quality oriental rug in the size a Dana can use is not that expensive, and gives a luxurious feel below. 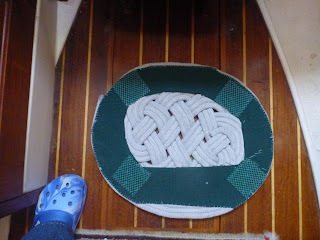 The rope mat, made by Karen, helps keep the cabin dry and clean. This mat was made from our old mainsheet; it's an ocean plat knot with a flemished coil. Instructions can also be found in The Arts of the Sailor, a reprint of a lovely book from an earlier age by Hervey Garrett Smith. It's not all that hard to make, just fiddly. Here it is close-up. You have to do some stitching on the underside to keep the flemished coil together. To give it a little more non-skid grip, Karen sewed a scrap of canvas on the back with corners of common shelf liner that's often used as boat placemats. This cockpit mat is our old genoa sheet. 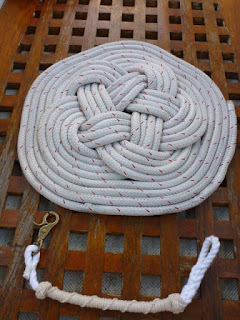 It's a flattened Turk's Head knot, also with a flemished coil. Not hard to make, and nice for massaging the feet! Pillows for storage! This might be something everyone already knows about, but stuffing pillows with sweaters or blankets or bedding is a nice way to store that stuff and save space. This pillow contains a wool sweater. The 2 kilim pillows contain extra bedding; the green quilt (made by Karen--that's a Dana 24 embroidered on it--hides the double sleeping bag which goes into the foot well of the V-berth. 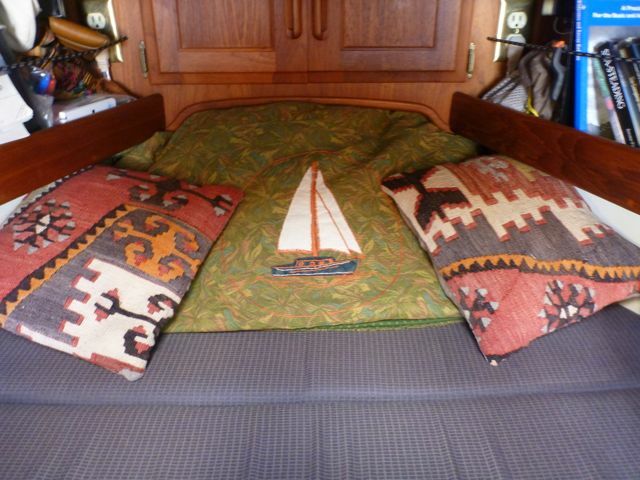 V-berth cushion improvement: You can see that the V-berth cushions are separated a bit differently than the norm of one big split down the middle. 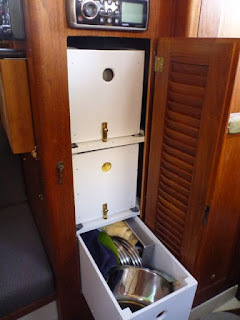 When we sprang for the new cushions we wanted to be able to retrieve items from the lockers forward without having to pull everything out of the V-berth, so we had them measured and sized in 3 separate pieces, each lined up with its locker edge. Now if we want to get a sail out, there's only one cushion to lift! And they are comfortable to sleep on, too. Dinghy outboard motor mount: We needed a stern mount for the 2-hp dinghy outboard that would not interfere with airflow to the self-steering wind vane, so Leif made this one out of teak and secured it with simple lashings, just under the stern pulpit. 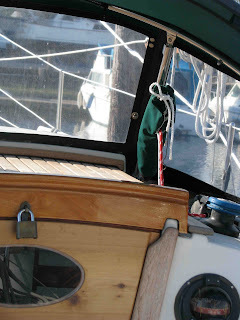 The block and tackle for lifting and lowering the outboard is above it on the arch. After 10,000 miles this system still works brilliantly. And these are side views. 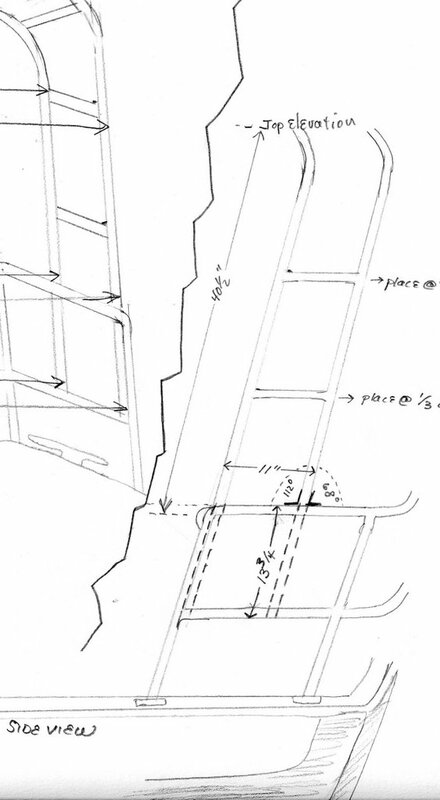 This drawing was enough for the craftsman to work from. We ended up attaching it only to the stern pulpit and not all the way down to the wood as shown in the side view on the right. Bracing was easy but also necessary to keep the arch and pulpit rigid. Here are two photos showing where Jim installed the braces. The first is at the base of the forward side of the stern pulpit, with a short strut on each side tying it into the cockpit coaming. 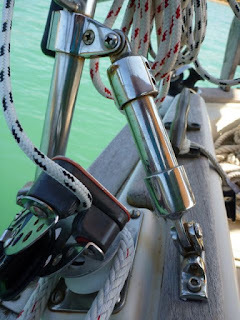 These little braces are also handy to grab at sea. 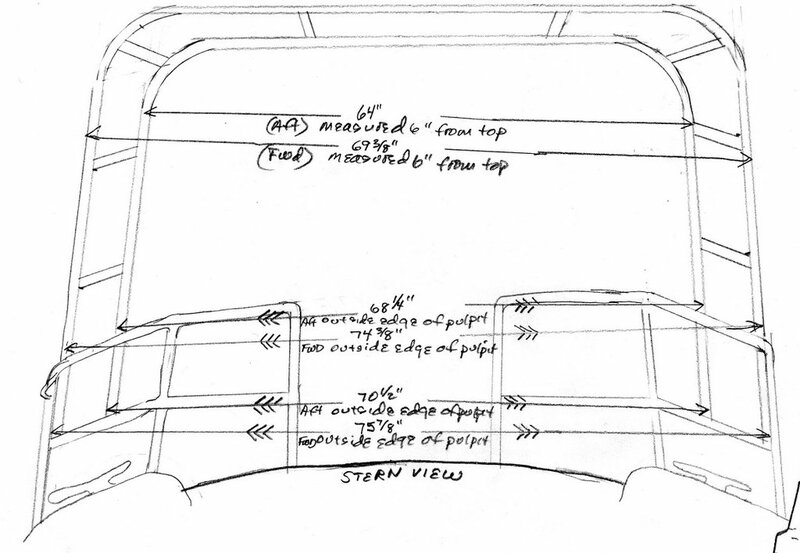 The second brace leads from the aft strut of the arch to aft near-center on the stern pulpit. 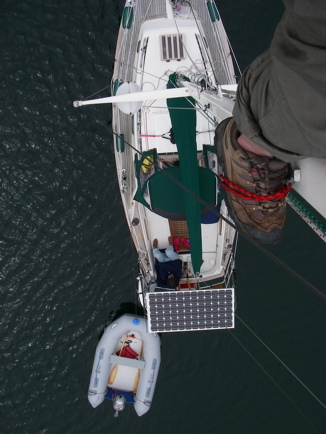 Here you can also see a pinrail, a fishing pole, a trolling reel lashed to the arch, part of the dinghy outboard hoist, the forward-leading brace for the solar panel, an antenna for picking up internet signals better, and the aft edge of an underway awning, secured with quick-release shock cord so it can be taken down in a hurry. When not needed the awning can be rolled up and secured to the top of the dodger. 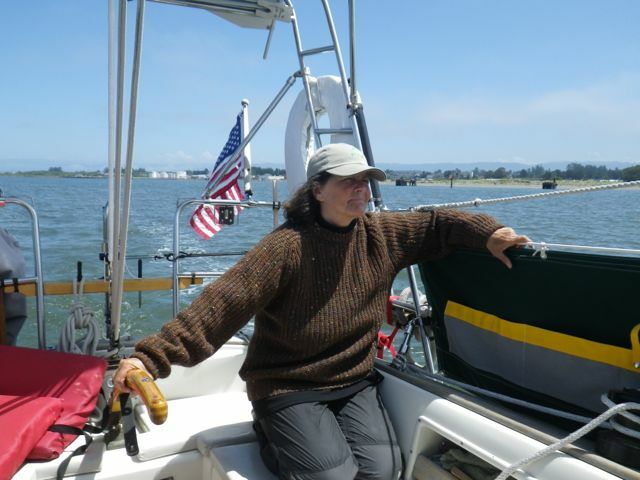 Karen made the awning from a square of marine canvas she bought off the scrap heap at a canvasmaker's shop in California. 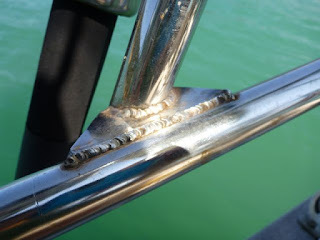 Weld attachment: Here's a close-up of the way the arch was welded to the stern pulpit. Two of these brackets were cut for each attachment point, and welded on. In all the miles we've traveled, this has worked flawlessly. 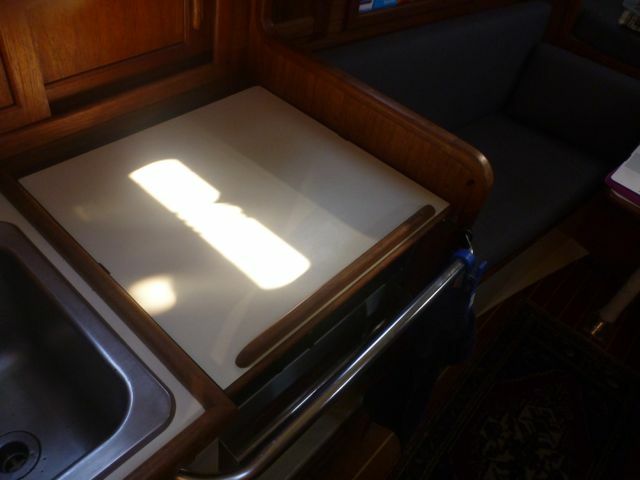 Solar panel: This 175-watt panel runs the boat's systems with only a rare push from the diesel after a string of rainy or cloudy days. 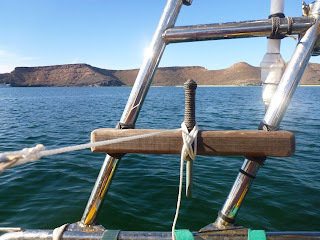 Dinghy chaps: These took a full week to sew by hand in La Paz, but a fifteen-dollar investment in polka-dot blue and yellow fabric remnants and a whole lotta labor has kept the dinghy better protected from chafe and the effects of the hot sun. They were to be a pattern for the "real" set made of marine canvas, but Karen hasn't worked up the energy needed for that yet. Pinrails: Leif fitted a small pinrail to each side of the arch, and here's a better view. 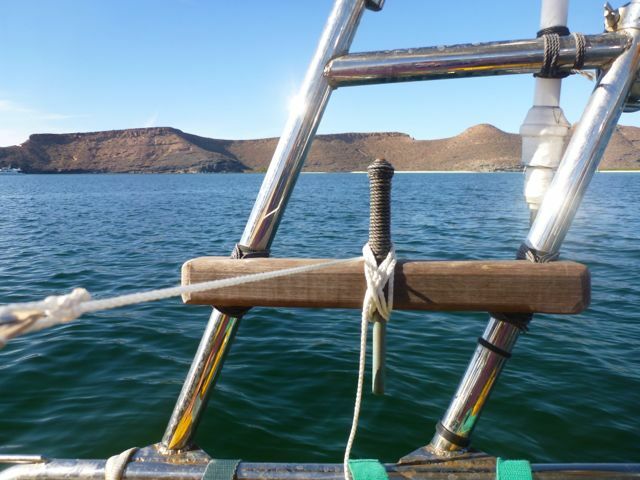 The pins he made out of solid bronze rod, wrapped very tightly on the upper part with tarred marline. The whole thing is lashed to the arch with the same marline. They cost a fraction of what cast bronze belaying pins do. Leif also made us pinrails fitted to the shrouds, shown below. We love them. Each halyard and line has a home, and there's no crowd of rope around mast cleats that will thump against the mast in the wind. Plus, the pinrail is a more secure place to stand behind at sea. Those are chest-high lifelines going through a lashed grommet over it; we've since switched them to spectra since this photo was taken. Gasoline storage: After fitting Sockdolager's Cap Horn wind vane self-steering system on her transom, Jim saw an opportunity for storage of our two 1-gallon outboard engine gas jugs in a place where fumes will stay off the boat. 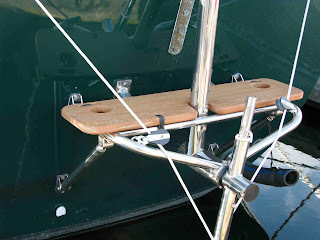 Leif fashioned this teak platform atop the wind vane's frame, and now the two gas jugs have a home. They stayed there even when we were hove-to for two days off the Oregon coast, and in 10,000 miles have not moved. See-thru hatch boards: Leif made us new hatch boards of thick cedar, with oval plexiglass windows (including a small one for looking at the GPS,) and we love them. They're light and easy to stow. We still have the original teak boards too, but find these cedar ones give more light in the cabin and are easier to use at sea. Water bottle cockpit storage: Here's an idea for keeping a nalgene water bottle under control under the cockpit dodger. This little pocket, below, with its adjustable snap-on handle (we also found an off-the-shelf black neoprene model in California for comparison) does a good job of making it easy for the on-watch person to stay hydrated. Note also the cap with the narrow opening. 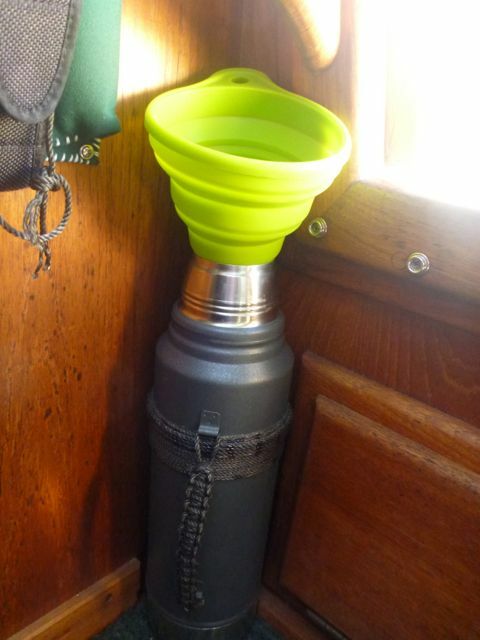 Using the regular wide-mouthed cap will ensure that you dump water down your neck; narrow openings prevent spills. 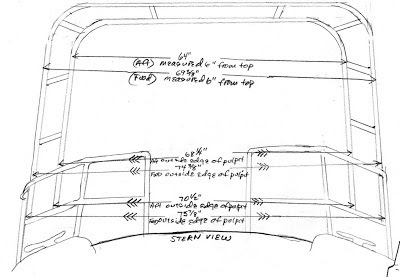 Jim came up with the idea of the black piece of rope sewn to the aft edge of the dodger's side; it acts like a rain chain, to deflect water that would otherwise drip into the cockpit. 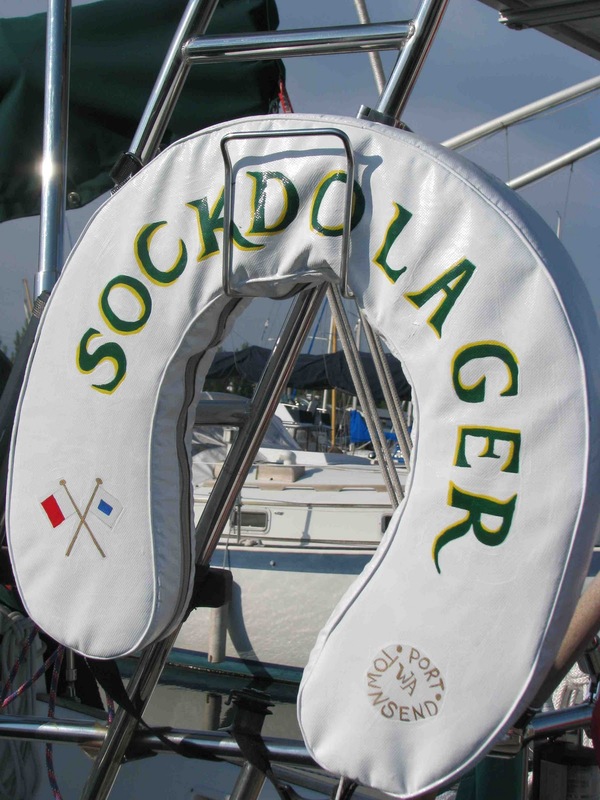 Works like a charm, and also prevents chafe on the dodger fabric. This little dodger bag lashed to one of the struts helps keep lines organized. Here's the dodger bag on the starboard side. Weathercloths: These haven't been used a lot, mostly in cold windy climes, but when we needed them we were mighty glad to have them. 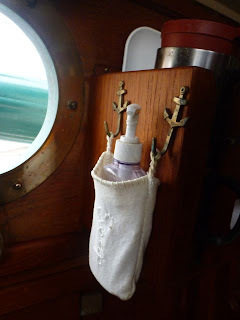 They keep not just spray but entire waves from washing into the cockpit, and in fact, on the sail from Tonga to New Zealand the starboard weathercloth stopped a wave and for its troubles got a stainless grommet ripped out of four layers of marine canvas. 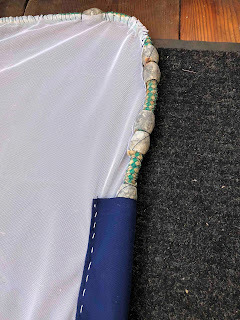 May as well make the inside of each weathercloth useful, with pockets for sheets and furling lines made of porous marine netting. This photo was taken at the beginning of the voyage. 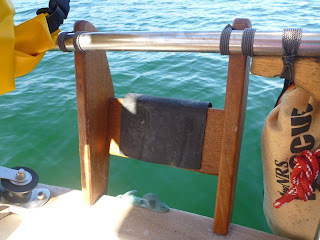 Old horseshoe, new tricks: You can give an old faded yellow horseshoe buoy new life using house paint and elbow grease. Karen's November 2012 article in Good Old Boat magazine shows you how. Hatch mosquito net: On Raven, we made a mosquito net for the forward hatch that doesn't require screwing snaps into the wood; an old piece of leaded line sewn around the perimeter of a piece of netting, with screen size designed to also keep out gnats (available online) weighs the net down around the hatch. If the wind's blowing hard enough to dislodge that much weight, you don't need a mosquito net anyway. 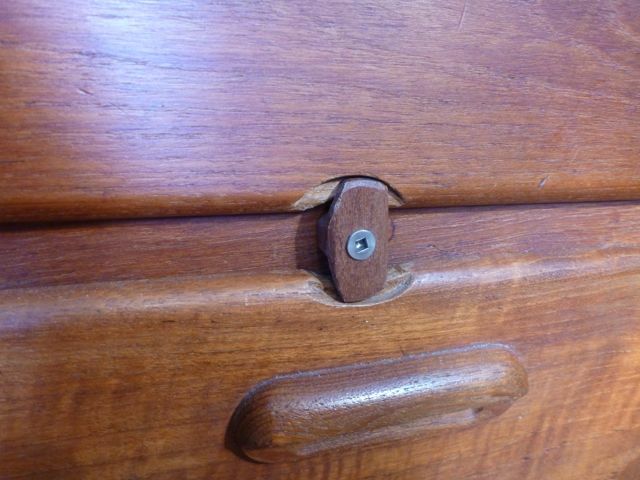 To keep the lead weights from scratching wood surfaces, a sleeve of fabric is sewn all the way around. By the way, many canvas-maker shops have a barrel or two of scrap material and will give some to you if you ask; it's perfect for small projects. Instead of getting rid of your old iPhones or Androids, turn them into backup chart plotters and also international phones (Jim's worked great with a Canadian chip.) 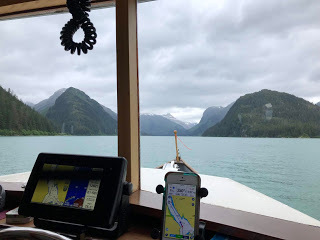 You can remove the chip on a GPS-enabled iPhone and it will still navigate using compatible software--we use Navionics. You can wirelessly sync your old and new iPhones, which is helpful because you only need to plot a course on one device and transfer it to all devices. Unfortunately, our Garmin chartplotter, which we love, does not sync with Navionics but it's still helpful to have both screens open.